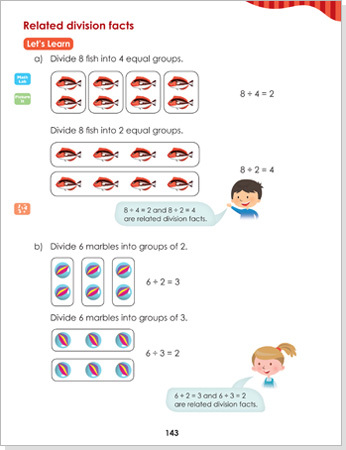 PR1ME Mathematics enhances teachers' pedagogical content knowledge and provides the support for teachers to deliver high quality lessons. The scope and sequence of PR1ME Mathematics is based on a composite of learning progressions identified as the best practices of the top-performing nations: Singapore, Republic of Korea and Hong Kong. 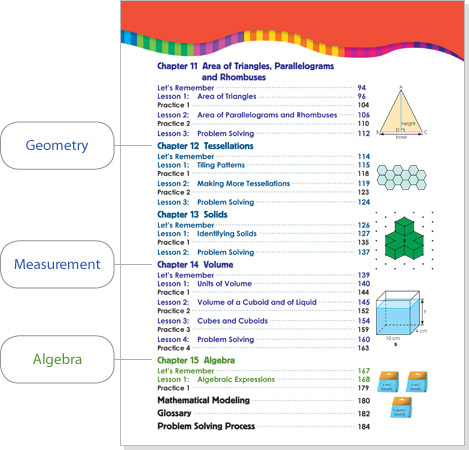 PR1ME Mathematics covers five strands of mathematics across six grades: Numbers and Operations, Measurement, Geometry, Data Analysis and Algebra. Strands are color coded for easy reference. The content in PR1ME Mathematics is presented under five strands of mathematics across six grades: Numbers and Operations, Measurement, Geometry, Data Analysis and Algebra. 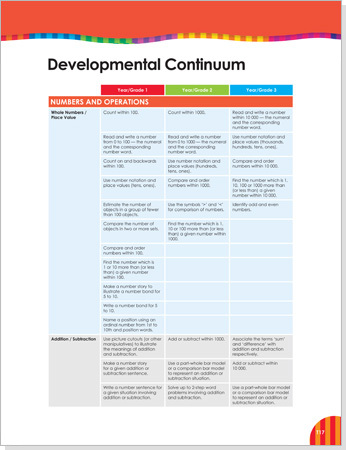 For each strand of mathematics, teachers are shown what is to be taught at each grade and how the progression build-up is done from one grade to the next. Detailed learning outcomes over the 6-year course help teachers understand the scope and sequence of teaching. The instructional design and structure of the Coursebook provide clear and consistent guidance to teachers and enable teachers to deliver high quality lessons. 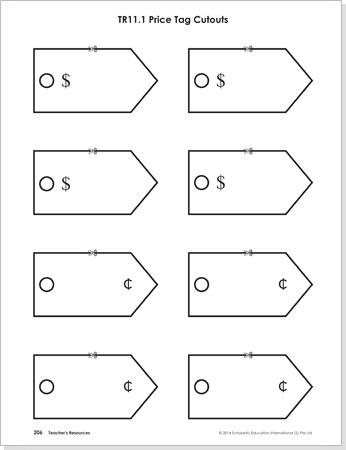 Objectives are listed at the beginning of each lesson. 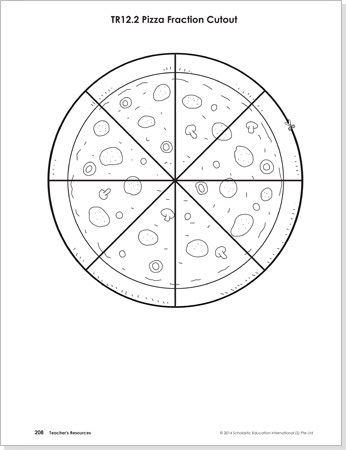 Consistent lesson design and use of icons make lesson delivery intuitive for teachers. 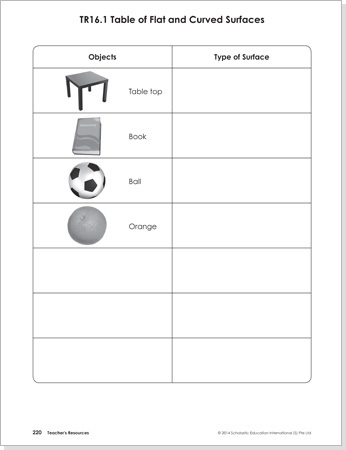 Prompts for teacher talk are provided through speech bubbles. 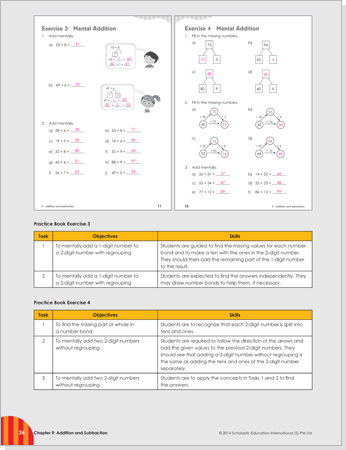 Comprehensive Teacher’s Guides provide an overview of concepts and skills taught in each chapter and detailed lesson notes for each page of the Coursebooks. 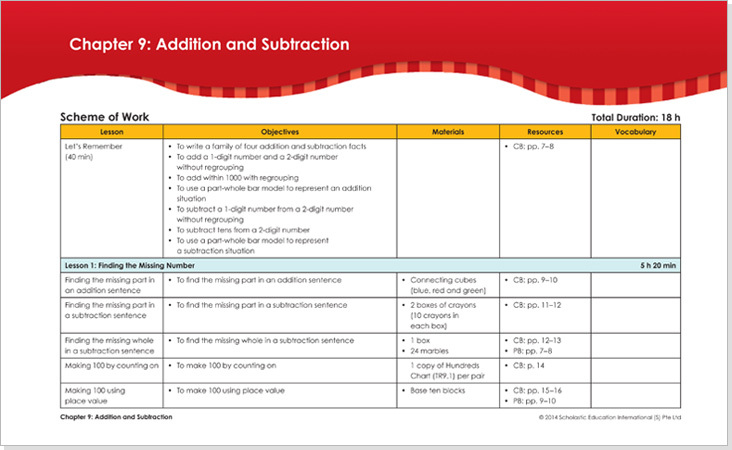 Suggested durations, lesson objectives, materials and resources lists help teachers plan each lesson quickly and easily. Lesson notes wrapped around Coursebook pages provide instruction on how to deliver lessons for each page of the Coursebooks. 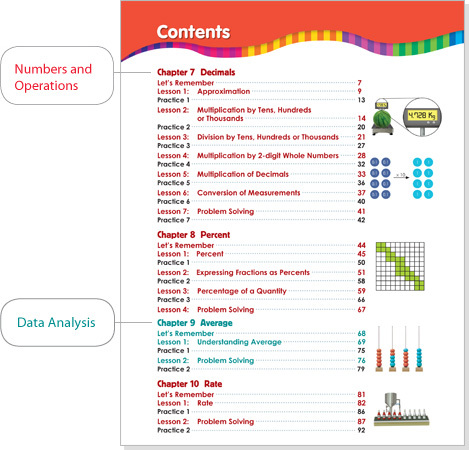 Note for Teachers identifies the key mathematical ideas of the chapter. 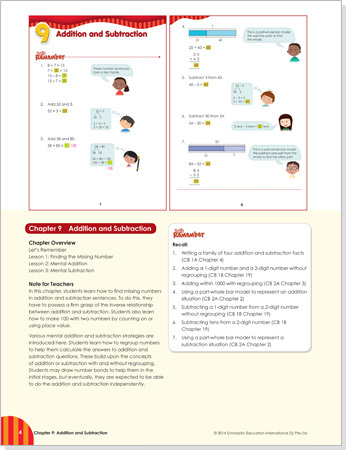 Answers for practice tasks in the Coursebook are provided with worked solutions for all word problems. 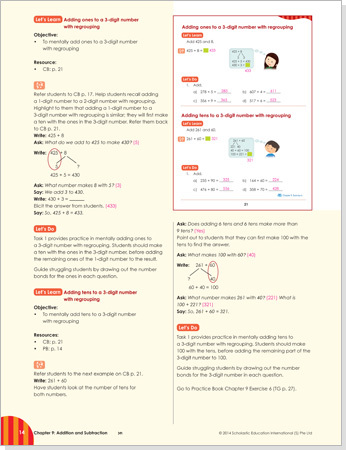 Scripted lesson notes provide guidance on what to say and do to achieve desired outcomes, and expected answers and tips on managing misconceptions. 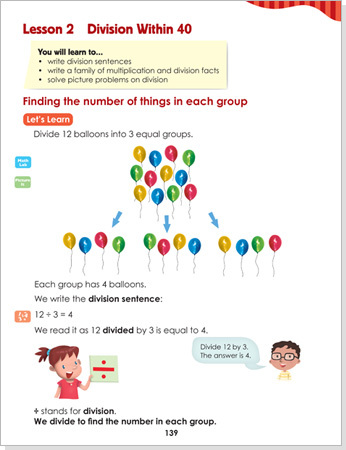 Answers for practice tasks in the Practice Book are provided, with worked solutions for all word problems.